Oceanfront et proche de la plage, des magasins et des restaurants. Ocean Front 3 chambres à coucher avec de belles vues! L'accès à la plage est à 100 mètres de votre porte d'entrée. Cette maison a une salle d'observation qui ressemble à un navire sur l'océan à marée haute! Également un salon avec cheminée en pierre et agate qui surplombe le surf et la plage. Des boutiques amusantes, un restaurant et des films sont à quelques pas. Allongé au lit avec le son de l'océan la nuit. Explorez les bassins de marée à proximité, faites voler des cerfs-volants ou construisez des châteaux de sable le jour. Les romantiques vont adorer le pin noueux et sa décoration chaleureuse. La table à manger peut accueillir 6 avec des vues de surf et de sable et Wifi. L'été 2019 juillet et août a un minimum de 4 nuits (à moins de combler un vide). S'il vous plaît éviter de quitter "Single Night Gaps" juin-septembre et vacances de printemps. Week-end du Memorial Day et de la fête du Travail 3 nt. Min. Fun little house right on the beach with an incredible view of the ocean. There wasn&#x2019;t quite enough seating for our group of 6. The viewing room, with 3 walls of windows lacked seating for everyone. Since that was where everyone wanted to be, we made do with the use of dining room chairs. Not super comfortable. On our previous visits there was a sm. couch and two comfy chairs in the room. Sorry to see them missing. The living room had comfortable seating for 5. One of our group always sat on the floor. But, overall, a fun little place. Our stay at the Seamist was absolutely glorious! We are 4 retired ladies that worked together for over 30 years. This house was everything we hoped for and more. We spent hours in the sunroom watching all the activities on the beach. The proximity to the beach was great for two of use that liked to walk and an easy drive to all other activities in the area. Great to have you back again ladies! First off change your picture to the right. There are not two cushy chairs with arms in that room!!!! Very misleading!!! Going towards the house on the steps the railing has come apart from the frame. Very dangerous!!! The house is nice. Beds were so so. But I asked if there were 6 beds and there were only 4 and a top bunk! For 70 yr old women not a good thing!!! One lady couldn't go and the 5th one slept on the couch!!! No the house had not been cleaned when we arrived after 3pm! After a phone call a lady did arrive and made the beds put out towels and took out the garbage! Nothing else. The location is good. Lots of entertainment watching the cars get stuck on the beach. The best part of all was the view from that room!!! 4 ladies shared this house. 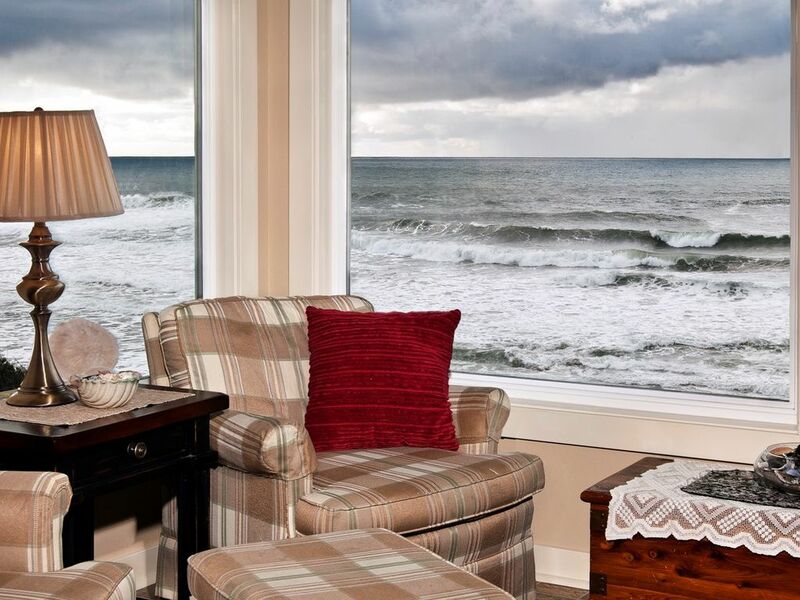 As soon as we unlocked we saw whales spouting just outside the big windows. One of our group is in her 80's, so the view was great for her. The beach access was too steep for her however, so we drove down to the D River parking lot where it was easier for her. Glad you enjoyed the whales! See you again soon! Our experience was great! We saw plenty of whales, enjoyed our walks on the beach and watching people get stuck in the sand! Happy that you enjoyed the whales and motorists! Come visit again soon! Fermer 5 blk à pied des magasins, restaurants et restaurants. Il y a des galeries d'art, des boutiques de souvenirs et le casino de Lincoln City. Glaces, café, restaurants, etc. Lincoln City ... 7 miles de la plus grande et de la plus belle étendue de plage du Pacifique NW. La meilleure chaudrée de palourdes sur la côte de l’Oregon chez Gracie’s, à In Depoe Bay, à 16 km au sud. et aussi 1 heure de voyages d'observation des baleines. Vous êtes également à 20 min. conduire vers Newport (grand aquarium conçu pour les petits enfants de tout âge et le quai des pêcheurs ... beaucoup plus de magasins, de fruits de mer frais, etc.